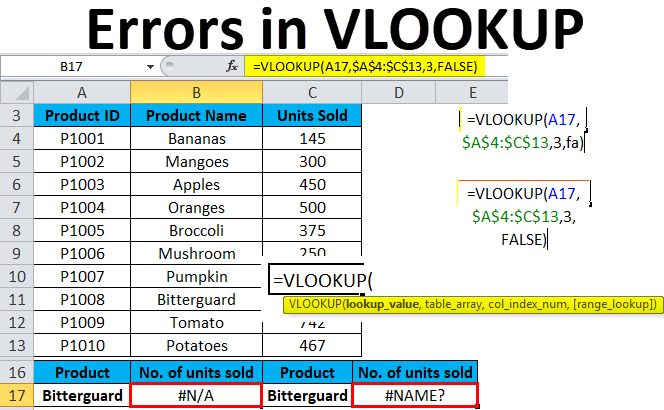 VLOOKUP Errors (Examples) | How To Fix Errors in VLOOKUP? 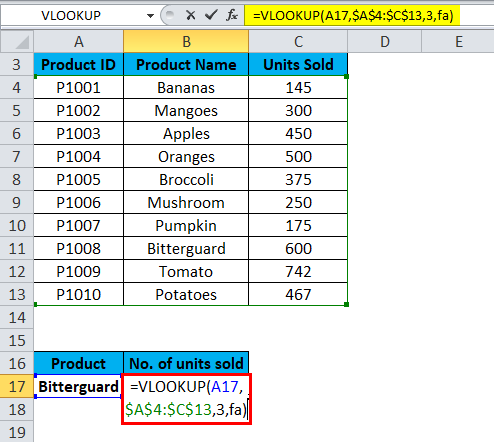 VLOOKUP is a very famous formula in all the available lookup formulas in Excel. This function is one of the most intricate Excel functions. It has several limitations and specifications, which can be lead to various problem or errors, if not used properly. In this article, we will cover simple explanations of VLOOKUP problems and their solutions and fixes. We should always first check the most obvious thing. Misprint or type errors occur when you are working with large datasets or when a lookup value is typed directly in the formula. One constraint of the VLOOKUP is that it can only look for values on the leftmost column in the table array. If your lookup value is not in the first column of the array, it will display the #N/A error. Let’s take an example to understand this problem. We have given the product details. Let’s assume that we want to retrieve the number of units sold for Bitterguard. And it will return #N/A error in the result. Because the lookup value “Bitterguard” appears in the second column (Product) of the table_array range A4:C13. In this condition, a formula is looking for lookup value in Column A, not in Column B. We can fix this problem by adjusting the VLOOKUP to reference the correct column. If that’s not possible, then try to move the columns so that the lookup column is the leftmost column in the table_array. The lookup value should not be more than 255 characters. If it exceeds this limit, this will end up with the #VALUE error. By using INDEX/MATCH functions instead of VLOOKUP function, we can overcome this problem. If you want to pick the records from another workbook, you have to conclude the full path to that file. It will include the workbook’s name (with extension) in square brackets , and then specify the sheet’s name followed by the exclamation mark. Use apostrophes around all this in case either a workbook or Excel sheet name contains spaces. If anything is missing or any part of the formula is missing, VLOOKUP formula won’t work and it will return the #VALUE error in the result. This problem occurs when you have accidentally misspelled the function’s name or argument. Let’s again take the product table details. We need to find out the number of units sold in reference to the product. As we can see that we have misspelled the spelling of FALSE. We type “fa” in place of false. It will return the #NAME error as a result. Check the spelling of the formula before hitting enter. VLOOKUP formula has more limitation than any other Excel functions. Because of these limitations, it might often return results different from what you expect. 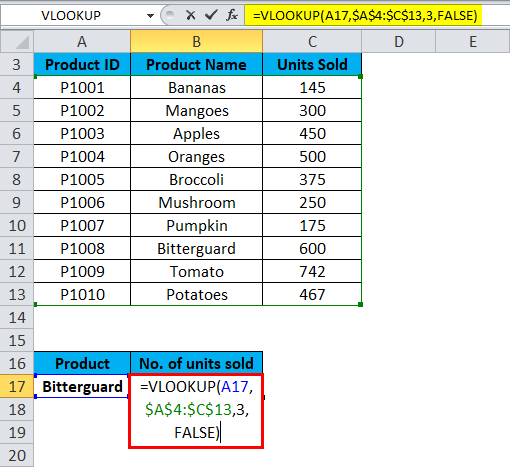 In this section, we will discuss for a few common scenarios, when VLOOKUP function fails. If your data containing several entries in UPPER and LOWER letter case, then VLOOKUP function works the same for both types of cases. If you are reusing the VLOOKUP formula and you made some changes in the dataset. 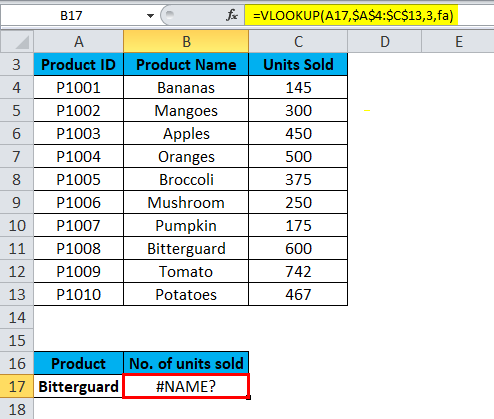 Like inserted new column or deleted any column, it will leave an impact on VLOOKUP function results and it won’t work at that moment. Whenever you add or delete any column in the dataset, it impacts the arguments table_array and col_index_num. Always use absolute cell references with the $ sign in table_array. This you can use by pressing the F4 key. That means to lock the table reference so that while copying the formula to another cell, it won’t create a problem. 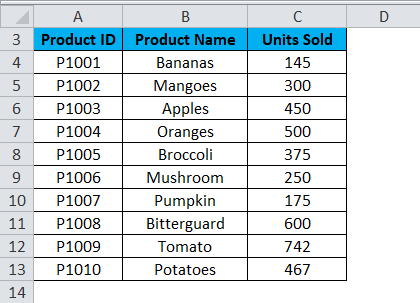 In the table, cells with numbers should be formatted as Number, not text. If your data contains spaces then it also can lead to an error. Because we can not spot those extra spaces available in the dataset especially when we are working with a large amount of data. Hence you can use the TRIM function by wrapping the Lookup_value argument.